Last Monday I had shared the story of Samudra Manthan/Palazhi Madhanam. I had promised last week to share Lord Ayyappa’s story today. But it had to be postponed to next Monday because this story of Rahu and Ketu was equally important to share and it had to be told to complete Lord Vishnu’s Mohini Avatar. Since this story is a continuation from there, I would suggest you to read it before going ahead. Lord Vishnu’s Vishwa Mohini Roopam had helped the Devas obtain Amrita (the nectar of immortality) that the Asuras had snatched from Lord Dhanvantari and get rid of Sage Durvasa’s curse. Finally they defeated the Asura army lead by King Bali. As I was going through various versions of this story I read this particular one which was new to me. Sharing it for the knowledge of my readers. Mohini bewitched the Asuras with her beauty and made them agree to share Amrita with Devas. She had made Devas and Asuras sit in two lines. While the Asuras bedazzled by Mohini’s enchanting beauty and their desire to get married to her kept their eyes tightly shut, Mohini served Amrita to all the Devas. One of the Asuras, Swarbhanu, opened one of his eyes and smelled something fishy. 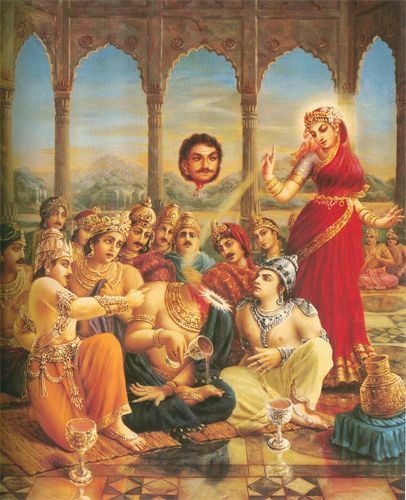 He realized that Mohini had served almost all of the contents of the pot of Amrita to all the Devas. He disguised as a Deva and quietly sneaked over to the other side and sat next to Surya and Chandra. Mohini did not notice this changeover and mistaking Swarbhanu for a Deva, she served Amrita to him as well. Swarbhanu was the son of Viprachit (father) and Simhika (mother). Simhika was the daughter of Hiranya- Kashyapa the great demon who was the father of Prahlaadha, the greatest devotee of Lord Vishnu. By now Swarbhanu had taken the Amrita in his mouth and was about to gulp it when Mohini changed into Lord Maha Vishnu’s Vishwaroopam form. He immediately charged his Sudarshan Chakra towards Swarbhanu’s neck, preventing him from swallowing the Amrita. Since a bit of Amrita had flowed down his throat, Swarbhanu had become immortal. He did not die but his head was separated from his body. Lord Brahma made Swarbhanu’s head and body join with a snake. The head joined a snake’s body and came to be known as Rahu and the snake’s head joined with Swarbhanu’s body and came to be known as Ketu. Lord Brahma granted Rahu and Ketu a boon for accepting this new form, a place amidst the planets, the Navagrahas. Depicted as a serpent with no body riding a chariot drawn by eight black horses, Rahu is one of the navagrahas. The other name of Rahu is Bhayanaka. It is believed that Rahu occasionally swallows the sun and the moon for pointing him out to Lord Vishnu and this is what causes the solar and lunar eclipses on our planet. According to Buddhist Mythology, in the Candima Sutta and the Suriya Sutta, Rahu attacks Surya and Chandra before being compelled to release them by their recitation of a brief stanza conveying their reverence for the Buddha. The Buddha responds by enjoining Rahu to release them, which Rahu does rather than have his “head split into seven pieces”. The verses recited by the two celestial deities and the Buddha have since been incorporated into Buddhist liturgy as protective verses recited by monks as prayers of protection. This is something I came across on Wikipedia. I am not sure of the truth about it, but I am amazed at how different mythologies are interlinked. Rahu and Ketu’s power increases between sunset to sunrise. Their power of vengeance is so strong that they cause an astrological moment called the Rahu Kaalam that stays every day during the day for 1 hour and 30 minutes. This time is considered to be highly inauspicious for undertaking any good deeds. Now I know that these mythological stories made my Muthachan (maternal grandfather) stop us for a while before stepping out of the house for my Mema’s (maternal aunt) matchmaking. Rahu and Ketu control over one’s courage, action, sorrow, valour, sin and provide for mental troubles and worries in current life depending on one’s own past karmas in their past lives. Rahu governs over the head portions, while Ketu governs over one’s ears, speech and hearing etc. Once Hanuman was chasing Surya mistaking him for a ripe fruit. That’s when he spotted an unusual Rahu with the head attached to a snake’s body. He looked like a fire-spitting dragon. Hanuman chased Rahu. Rahu ran for his life and sought help from Indra. Indra attacked Hanuman’s jaw with a strong thunderbolt. This is the incident that made Vayu, Hanuman’s father, to withdraw air from the world. Vayu was later pacified by all the Gods and Hanuman was granted lots of boons including Lord Brahma’s powerful boon of escaping even the Brahmastra. Another story from the Ramayana says that King Ravana had once imprisoned all the Navagrahas (the nine planets) and Hanuman had got them released. All grahas thanked Hanuman. It is thus believed that the negative influences of any graha can be overcome by worshiping Lord Hanuman. Recommended References: The lesser known story of Rahu and Ketu!